Clothing, Food, Housewares, & More! 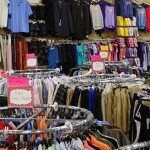 TNT Liquidators offers a wide array of name brand discount men’s, women’s and children’s clothing! TNT Liquidators is an American owned, local family operated business since 1993.